Your order will ship MONDAY if placed in the next 2 hours 53 minutes . Enter your shipping address zip code to receive an instant delivery date estimate from UPS. 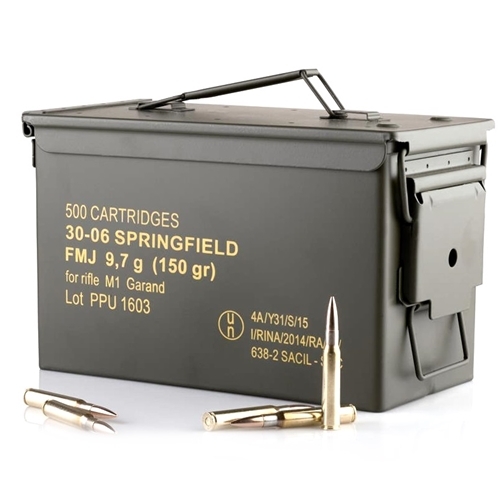 Prvi Partizan 30-06 Springfield Ammo M1 Garand 150 Grain Full Metal Jacket 500 Rounds in Ammo Can ammo for sale online at cheap discount prices with free shipping available on bulk 30-06 Springfield ammunition only at our online store TargetSportsUSA.com. Target Sports USA carries the entire line of Prvi Partizan ammunition for sale online with free shipping on bulk ammo including this Prvi Partizan 30-06 Springfield Ammo M1 Garand 150 Grain Full Metal Jacket 500 Rounds in Ammo Can. Prvi Partizan 30-06 Springfield Ammo M1 Garand 150 Grain Full Metal Jacket 500 Rounds in Ammo Can ammo review offers the following information; Prvi Partizan 30-06 Springfield M1 Garand ammo for sale is a new production of ammo that features a 150 Grain Full Metal Jacket bullet. 30-06 Springfield (M1 Garand) ammo by Prvi Partizan is reloadable, features brass cases and Boxer primers and is non-corrosive ammunition. This Prvi Partizan 30-06 Springfield M1 Garand ammo is packaged in cases of 500 rounds with free shipping available. This 30-06 Springfield ammo is specially formulated to have the correct pressures to function properly in your Garand without damaging your op rod. Most modern 30-06 ammo features pressures that are too high to be used in an M1 Garand and are designed for modern bolt action hunting rifles. Since 1928, Prvi Partizan has been manufacturing custom ammunition in Serbia for those shooters seeking experience in competition, indoor ranges, and big game hunting. Prvi Partizan is currently a modern factory that is side by side in association and competition with the most well-known ammo manufacturers around the world. Prvi Partizan ammo manufactures a wide range of commercial and military calibers for hunters and target shooters. All Prvi Partizan ammo meets SAAMI standards and is managed by an internal quality system to make sure there is 100% customer satisfaction. Full metal jacket loads are non-expanding rounds that were designed for target shooting because of their good penetration ability. Most modern 30-06 ammo features pressures that are too high to be used in an M1 Garand and are designed for modern bolt action hunting rifles. Order a case quantity of Prvi Partizan 30-06 Springfield Ammo M1 Garand 150 Grain FMJ 500 Rounds in Ammo Can and get Free Shipping! Great price and free shipping. Totally happy with my purchase. Have already referred to my friends. Great ammunition for a fantastic price. Received it quickly. Cannot ask for more! Prvi Partizan ammo for sale with free shipping on bulk ammo at cheap discount prices only at our online store TargetSportsUSA.com. Target Sports USA has the entire ammo line of PPU ammo for sale including Prvi Partizan 5.56mm ammo for sale as well as all their other rifle hunting ammo calibers such as 308 ammunition, Prvi Partizan 243 ammo, Prvi Partizan 222 ammo, Prvi Partizan 30-06 M1 Garand ammo, Prvi Partizan Argentine Mauser ammo, Prvi Partizan 7mm Remington Magnum ammo and many other hard to find ammo rounds. Prvi Partizan ammo review offers the following information; PPU ammo is made with high quality 100% new virgin brass that has never been fired, a non corrosive primer and the Prvi Partizan ammo is non corrosive and can be reloaded up to seven times for those high volume shooters that love to reload their Prvi Partizan ammunition. Prvi Partizan ammo is made in Serbia and used by shooters, police departments, military, competition shooters, law enforcement officials all over the world including the United States. Target Sports USA has Prvi Partizan handgun ammo for sale in the following calibers, Prvi Partizan 9mm ammo, Prvi Partizan 380 ammo, Prvi Partizan 45 ammo, Prvi Partizan 38 Special ammo, Prvi Partizan 40 Cal amm and many other PPU add ammo calibers such as 32 ACP ammo, 25 ACP ammo, 30 Mauser ammo, Prvi Partizan Russian Nagant ammo. In addition to PPU handugn ammo, Target Sports USA also has Prvi Partizan rifle ammo for sale in popular calibers such as Prvi Partizan 5.56mm ammo, Prvi Partizan 308 ammo, Prvi Partizan 30-06 Ammo, Prvi Partizan 243 ammo and many other add ammo calibers such as Prvi Partizan Argentine Mauser ammo, Prvi Partizan Swedish Mauser ammo, Prvi Partizan Swiss ammo and many other ammo that is hard to find. Free Shipping on all Prvi Partizan bulk ammo for sale at our online store Target Sports USA.